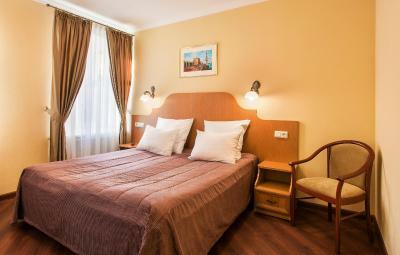 Lock in a great price for Gogol Hotel – rated 9 by recent guests! Hotel is so adorable and have stories, location is good to go anywhere. The hotel is perfect! It is our second stay here and we definantly will return. Highly recommended. Excellent location not not far from attraction places, so we can work around. Room is clean and staffs are very nice. Room was spacious and meticulously clean. Staff was efficient and all spoke excellent English. Don't be fooled by the mediocre entrance and registration desk (make sure you go to 3rd floor - 2nd floor is a different hotel). Rooms were excellent. Room 303 was a 2 room suite - separate living room and just off the dining hall (breakfast), yet with a double door to avoid getting disturbed by noise. Has a little balcony overlooking the canal. 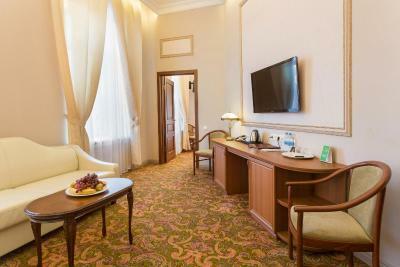 Very spacious, comfortable room, overlooking the Griboedov chanel. 3mins from metro station Sennaya/Sadovaya, where 3 metro lines meet. Superb location!! Staff is friendly and cheerful, and also very helpful! Amazing hotel that exceeded all expectations. 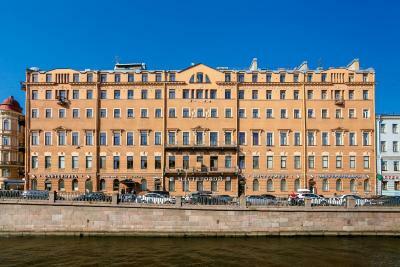 Our room had a wonderful view over the Griboyedov channel, and was very spacious. Free toiletries like toothpaste, slippers, bathrobe and much more were already in the room, very thoughtful. Breakfast was extraordinary, featuring mimosas, good coffee, Russian cheese patties, omelet, wonderful pastries and much more. 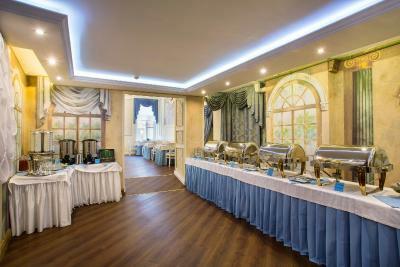 The hotel is surrounded with exceptional cafes and restaurants. They even have a free storage room to use if you have a few hours to explore the city after check out. The staff was excellent. They responded so cheerfully to every question and need we had. They surprised me with a birthday gift -- I think they overheard my friend telling me happy birthday, because no one in my party arranged this. They called taxis for us and told us exactly what the very reasonable fares would be. This is important because if you get a taxi on the street it could cost 2 to 4 times as much! When I was looking for a specific, unusual souvenir, the desk clerk called around until she found a store selling it. 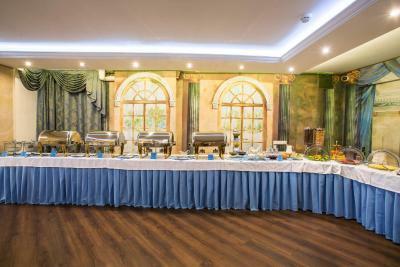 In addition to the delightful staff, the hotel is very well located for walking to attractions or to the metro and a variety of restaurants. This is not a luxury hotel, but it is extremely reasonably priced, clean, and delightfully staffed. 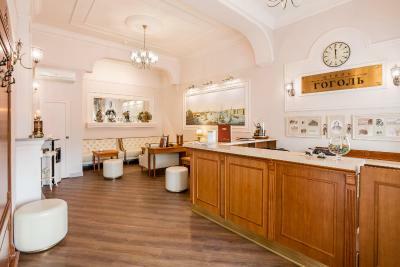 The staff in the reception were very helpful, always greeting you with a smile. The service personnel at the front desk were wonderful. 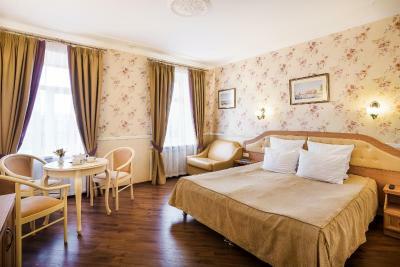 Gogol Hotel This rating is a reflection of how the property compares to the industry standard when it comes to price, facilities and services available. It's based on a self-evaluation by the property. Use this rating to help choose your stay! 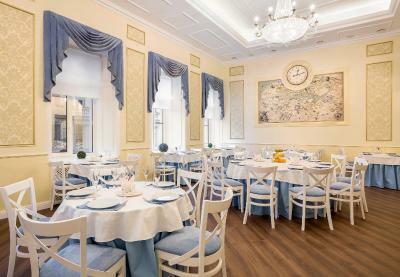 One of our best sellers in Saint Petersburg! 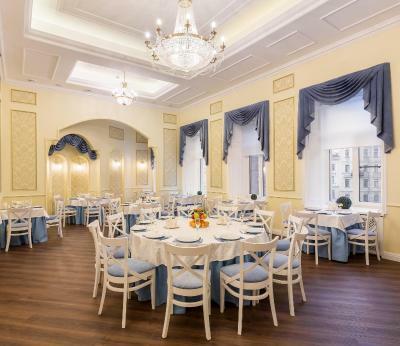 Free Wi-Fi and a restaurant are offered at this hotel, located 3 minutes’ walk from Sadovaya Metro Station in Saint Petersburg. 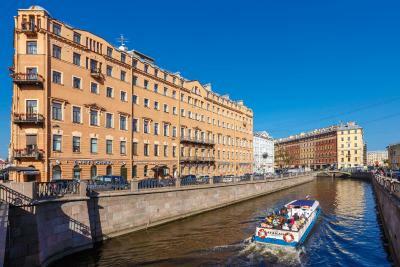 The Saint Isaac’s Cathedral is 15 minutes’ walk away. 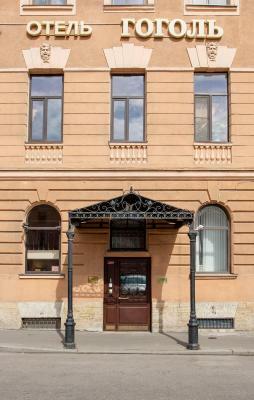 Guests of Gogol Hotel benefit from the central location, as Mariinskiy Theater is 15 minutes away on foot. The Russian Museum is 1 metro stop from the hotel. 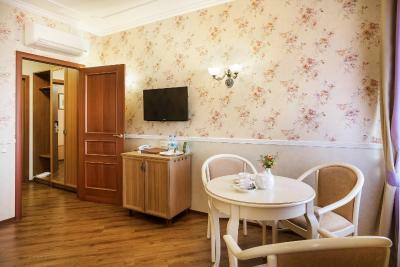 All the air-conditioned rooms at Gogol come with a flat-screen TV. Bathrooms include a hairdryer and bathrobes. 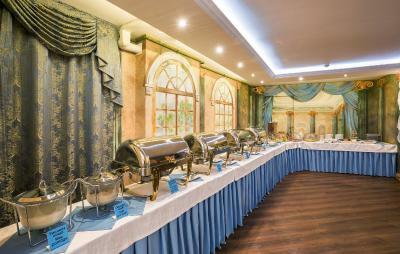 Buffet breakfasts along with European and Russian cuisine are served in the hotel’s restaurant, and a range of dining options can also be found within a 5-minute walk of the property. Moskovskiy Train Station is 10 minutes’ metro ride from Gogol Hotel, while Vitebskiy Train Station is 1 metro stop away. A shuttle service to Pulkovo Airport (9.9 mi) is available on request. 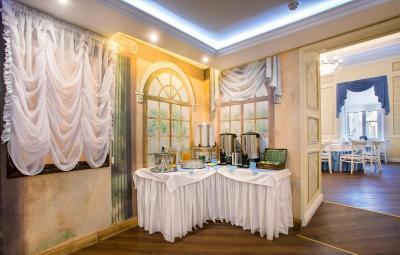 When would you like to stay at Gogol Hotel? Decorated in modern style, this bright air-conditioned room comes with a flat-screen TV. Private bathroom is fitted with free toiletries and slippers. There is no extra bed possibility in this room. 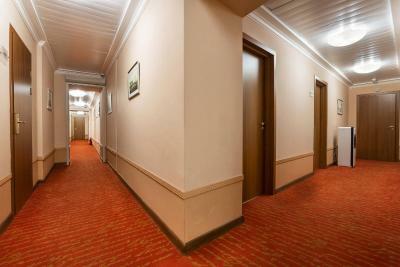 Decorated in warm colors, this air-conditioned room comes with a flat-screen TV. Spacious air-conditioned room comes with a flat-screen TV. An electric kettle is available. This room features a view of a calm yard. 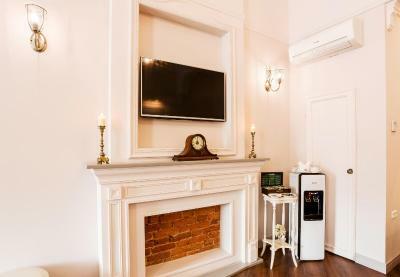 Decorated with elegant furniture, this air-conditioned suite comes with a flat-screen TV. 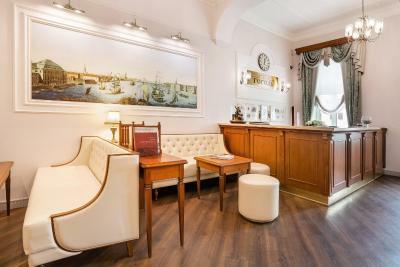 This suite features a seating area and a view of Griboyedova Canal. Private bathroom is fitted with bathrobes and slippers. 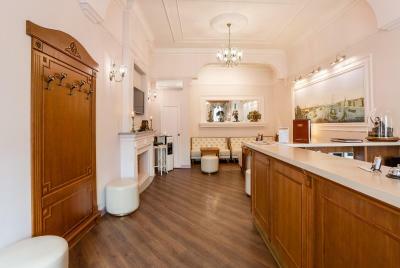 Decorated in classic-style air-conditioned suite comes with a flat-screen TV. An electric kettle is available. House Rules Gogol Hotel takes special requests – add in the next step! Any additional older children or adults are charged RUB 1000 per night for extra beds. Gogol Hotel accepts these cards and reserves the right to temporarily hold an amount prior to arrival. Please be aware that, it is not allowed to smoke at the hotel and rooms. Please note that visa support for foreigners is provided at surcharge. 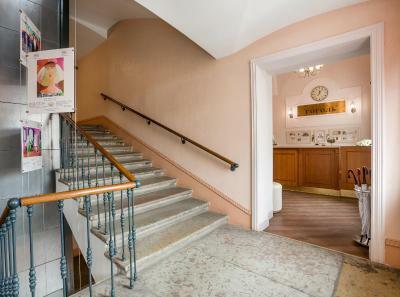 Please note that the reception is located on the second floor. Please note that the property can only accommodate pets under 4 kilos in weight. Please note that a credit card used for booking must be presented at check-in. In case the guest is not the card holder, please contact the property to complete the booking. Please note that when booking 3 rooms and more, special policies may apply. Breakfast was quite average for the overall standard of this hotel. Probably the best reception staff I have encountered anywhere. Very friendly and helpful. 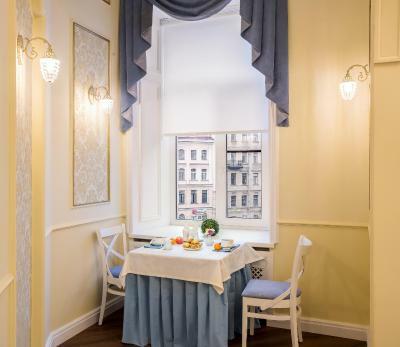 Hotel is located in a peaceful area within walking distance to Sennaya Square which is well connected to other parts of the city by three metro lines. Could have done with tea cups in the bedroom, UK or USA tv channels, curtains that cover the whole window. The toilet rolls need to be longer and the taxi to be cheaper. On the street or Uber is cheap, booking through the hotel was more expensive however they did arrange a discount as I hadn’t saved enough cash for an expensive taxi. He was great, helpful, polite and got me there on time so all in all excellent. Champagne on the breakfast buffet!! The bath in the room, toiletries were nice and the staff extra helpful and polite. I also loved the free tea facilities. Also loved the dressing gown and slippers. no vegan options for breakfast. great value, location, friendly staff. The breakfast is good. We still enjoyed it after staying for 6 days. Location is good. It has supermarket nearby and we can find may good restaurants near it. Also we enjoyed walking to church and museums. Bathroom was very wet and didn't dry up properly. Breakfast wasn't spectacular apart from sparkling wine and meringues. Tidy modern rooms in classic style. Peaceful athmosphere. Nice view of the canal. Close to metro. Noone speaks and understands English. The breakfast was extremely bad like a hostel. They do not even have a bread just toast bread. How can they get 4 stars like this? I loved this hotel, I had a junior suite booked and I made some request about it which were honoured and I was very pleased with it. The hotel itself is a very nice building, clean super comfortable and quiet. The room was quiet big the bath was amazing and the little balcony was fantastic. Staff was helpful and kind and the breakfast I mean...they have champagne! What a better way to wake up! 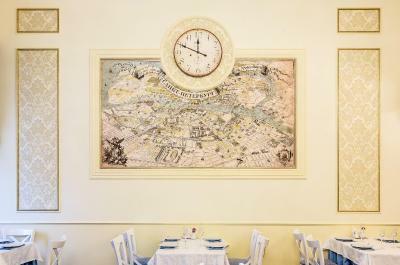 Fairly close to the center, about 10-15min and around you have few extremely good restaurant that you will find on the map available at the reception.